Way back before the season kicked off I was harping on the importance of being in first place on the table before our tricky final four matches in the Guinness Pro 12. Next Saturday, April does roll around and while we may have our minds on a different competition that particular afternoon, the fact that the Grand Final is in the Aviva has to keep us focused on both prizes throughout. As things stand now after 17 rounds, Leinster sit atop the table with 66pts, but Ospreys are just two behind and Munster 3, and they both face Italian sides this weekend so if we’re to maintain our advantage going into that sequence of fixtures, we definitely need maximum points against the Blues. It’s not like we’re not showing any kind of form...60-13, 70-6, 57-3, 40-14, 39-10, 54-22 and 45-9 are all results we have posted in the past three months. Plus, it’s not like this particular team from the Welsh capital isn’t used to having their backsides handed to them on a visit to Dublin - in 2012 we did it in both April and October. So where do the Cardiff Blues stand right now? Not so well on the Pro12 table...a top 6 slot would seem to be beyond them at this point, though that doesn’t mean their season is over. Finishing 7th or 8th will give them a playoff for a spot in the Champions Cup plus we won’t be the only ones at the RDS tomorrow with a European quarterfinal ahead of us...they face Gloucester next Saturday in the Challenge Cup. Whether this means they’ll be motivated to go after us in this match or save their energy remains to be seen but even with Sam Warburton unavailable they definitely have players who can hurt us, like in the back row with the tricky Josh Navidi and the steamrolling Nick Williams. 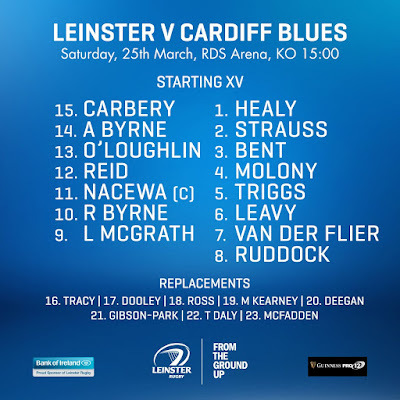 But the feature of this Leinster lineup is the players returning from injury, and in our own back row it’s great to see Josh van der Flier back in action. Ironically when he came a cropper it was against Edinburgh right after Dom Ryan had to leave the field. In that brief time Josh was united with Dan Leavy and the pair literally had an instant impact together as they combined for a key opening score. This time the pair start together so I will expect some strong carrying as well as a fierce competition around the breakdown...Rhys Ruddock is no slouch either at the number 8 position. 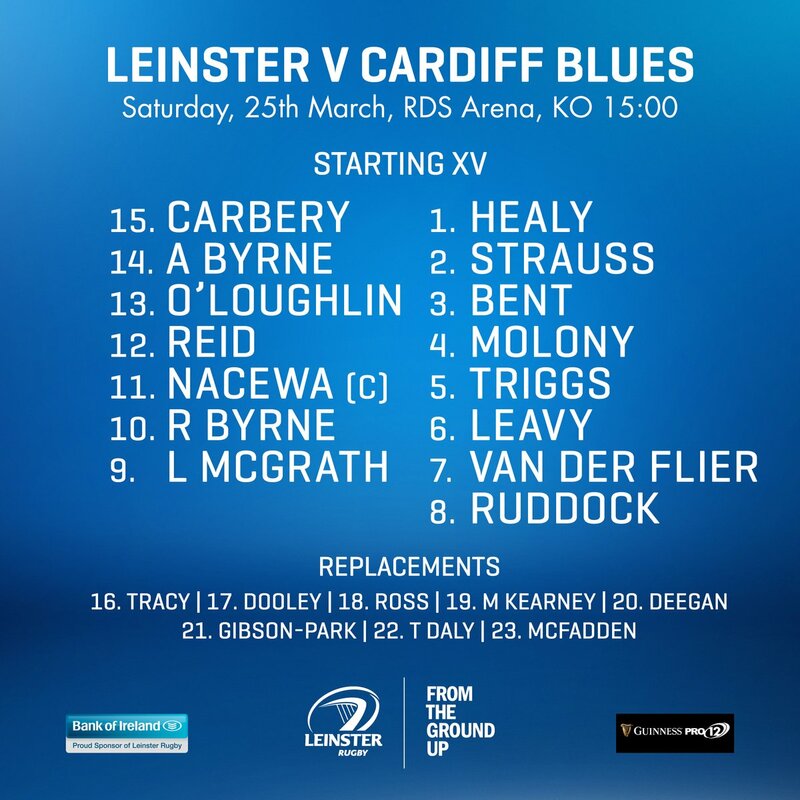 Surely the name that jumps out most for Leinster fans on the team sheet is our captain fantastic Isa - he’ll be chomping at the bit to lead the side out at the Aviva next week so his is also a timely return, and his influence extends way beyond his own playing ability, he’ll be a lift to a squad already on a high. Not to be forgotten in the “returnee” stakes is Rory O’Loughlin - Zane Kirchner deputized well in the centre but with the South African now bound for Newport it will be good to have Rory resume his partnership with Noel Reid, and also his seemingly telepathic link with Ross Byrne on kicks in open play. As some names return to the starting lineup we have a couple of Six Nations casualties...Rob Kearney has had a horrible run of injuries and this latest knee issue has him out for at least four weeks, while the biggest surprise is Jamie Heaslip who underwent minor surgery on his back and could be out for the same amount of time. Even in the absence of Devin Toner our set pieces are looking good - Molony, Triggs and Ruddock give us good lineout options while Michael Bent is in a decent run of form locking down the scrum. I could be pessimistic and say we’re “due” a bad performance but I simply can’t ignore the levels of confidence I have seen in our play of late. The bookies have us winning by 15 points - ideally I’d be delighted with a 20-19 win with four Leinster tries and no injuries but I’m thinking the visitors might take their foot off the pedal in the final quarter so I’ll be positive and say a 20-point home win.